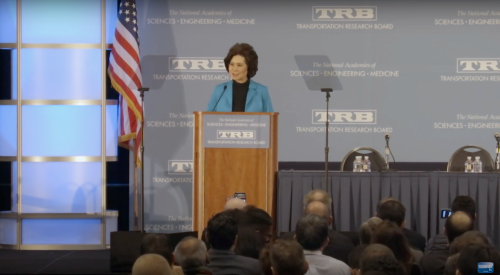 Elaine Chao, U.S. Secretary of Transportation, highlighted several new drone-related regulatory efforts initiated by the Federal Aviation Administration this week during a speech at the 2019 Transportation Research Board’s annual meeting in Washington, D.C. The first of those proposed regulations would allow drones to fly overnight and over people without waivers, if certain conditions are met; part of a “philosophy to encourage the widest possible development of safe new transportation technologies, so consumers and communities can choose the mix of options that suits them best,” she explained. That second proposal would identify “major drone safety and security issues” that may pose a threat to other aircraft, to people on the ground, or to national security and will solicit for consideration recommendations to reduce these risks as drones are integrated into U.S. airspace. Chao added that USDOT just award three contracts to commercial service entities to develop drone-based flight planning, communications, separation and weather services that will operate under 400 feet – contracts stemming from the agency’s Unmanned Aircraft Systems (UAS) Integration Pilot Program launched back in May of last year. The FAA added that this pilot project, which will be conducted through September 2019, is intended to develop and demonstrate a traffic management system to safely integrate drone flights within the nation’s airspace system. Also, the pilot project will create a “shared information network” to help gather data that can be used for future rulemakings.